Joyce Meyer will help repair the troubled, broken relationships with those around you. You will discover why strife destroys churches, how to disagree agreebly, the answer to strife between parents and children, how strife affects the anointing, how to forgive quickly in difficult situations, and how spiritual power is released through unity and harmony. - Publisher How can you experience peace when you're struggling with broken relationships, emotional bruises, or unresolved issues? Take control and restore tranquility---with God's help! In this revision of her bestseller Life Without Strife, Meyer shows you how to identify telltale signs of trouble, heal wounded friendships and family ties, and experience God's power and blessing. 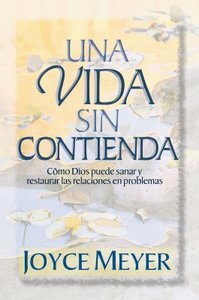 About "Una Vida Sin Contienda (Life Without Strife)"
How can you experience peace when you're struggling with broken relationships, emotional bruises, or unresolved issues? Take control and restore tranquility---with God's help! In this revision of her bestseller Life Without Strife, Meyer shows you how to identify telltale signs of trouble, heal wounded friendships and family ties, and experience God's power and blessing.